Wondering if Home Staging is for you? 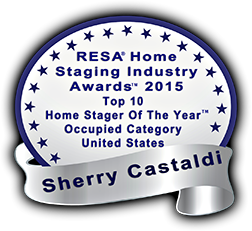 Please review Sherry’s frequently asked questions about Home Staging services below. No. Staging doesn’t have to be expensive. Stagers can work with budgets to help the seller gain maximum effect dollar for dollar. Staging is an investment to help the seller retain equity. When a home is properly prepared and appealing, buyers don’t look for concessions and may even bid over the list price at times. Almost always the investment in staging is less than the first price reduction, not to mention less time on the market. My home was professionally decorated. Why do I need staging? Homes that may be too taste-specific can be enhanced by a stager’s eye of how to de-decorate to appeal to more buyers. Buyers uncomfortable with very taste-specific décor may not be able to envision themselves living in the home. They may also view any cosmetic changes as work and project list costing money and may pass over the home’s true potential. Can’t I stage my own home? Even homes in mint condition can reap the benefits of having a Staging Professional assess the home as it is very difficult to be subjective about something as personal as you own home and see it through a buyer’s eyes. If a home feels too personal to the homeowner the buyers will feel like visitors and not be able to envision themselves in that home. Why can’t I let the buyer fix or change the house to their liking after they buy it? Today’s buyers want a move-in-ready home that they don’t have to do anything to but literally move their things in and keep their life rolling along. The old way of “just give them a credit” is not what today’s buyers are interested in. People are over-scheduled and stressed out, busy with work and family, not to mention most do not have the skills nor have the time to spend working on their home in the little free time they do have. They want to be able to enjoy and relax in the home they have just purchased. The buyer may have also put all of their finances into purchasing the home so there may not be a budget left for “fixing up” leftover issues from the previous homeowner. So it’s definitely to the seller’s advantage to take as many negative issues as possible out of the equation when offering their home for sale. When you leave items such as fix-ups and repairs to be passed along to buyers, they almost certainly will over estimate the cost of the work and lower their offer, if they make an offer at all. It is usually more economical for the seller to handle the necessary work in advance eliminating the potential low ball offers.